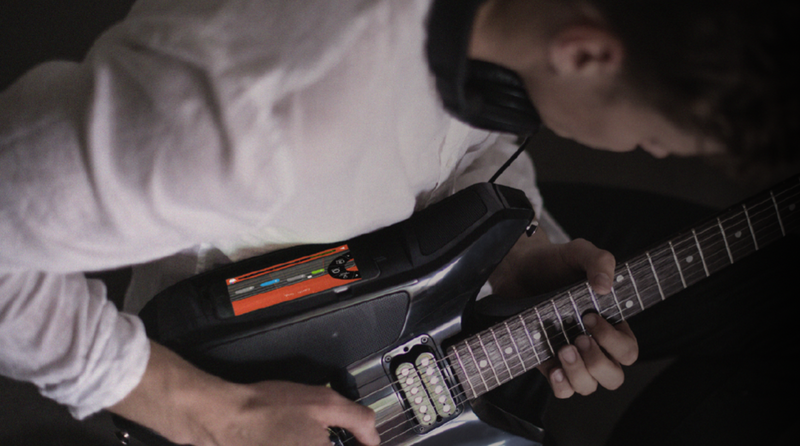 App-connected, digital-hybrid guitars are nothing new at this point. Whether it’s portable hardware like the Jamstik or Fender’s iOS-connected amps, companies have been trying to modernize the traditional guitar-playing experience for years. One of those outfits is Fusion Guitars, which came on to the seen with its all-in-one instrument back in 2015. After what could only be described as an extremely successful Indiegogo campaign (it brought in around $500,000 in crowd-sourced funding), Fusion Guitar is finally hitting store shelves in the US. Fusion Guitar is essentially a typical electric guitar – outside of that somewhat awkward form-factor you see in the images – with a few interesting add-ons. It has a built-in 20-watt D-Class amp, speakers, headphone connectivity and “seamless” iPhone integration opening a near endless level of tonal control. It works with iPhone 5/iPod 5th generation and up but there is no Android support unfortunately. As a quick side note, Fusion says the guitar is future-proofed by way of swappable iPhone docks. The company uses IK Multimedia’s Amplitube as an example, but just about anything that runs on your iPhone will work here. That includes the plethora of educational guitar apps and other processing units available on the App Store, making it as much a learning tool for beginners as it is a proper instrument for seasoned musicians. Fusion calls it the “world’s most advanced electric guitar” for a reason. It has a 24-bit/96kHz audio interface jammed right into the side of it where players can dock their iPhone. You’ll get around 4-6 hours of playtime on a single charge. As for the nuts and bolts of the actual guitar itself, this is a full maple neck with the option of going rosewood or maple on the fingerboard. The patented neck-thru-body design supports dual Humbucker pickups (with a parallel/series pull switch alongside the neck pickup). While these kinds of products just don’t cut it from some purists, it is good to keep in mind how they can end up adding to a player’s repertoire rather than replacing the traditional setup. Even someone completely turned-off by the the notion of connecting an iPhone with their precious Strat would have a hard time denying some of the unique sonic possibilities that come along with it. Considering how popular the Indiegogo campaign was, there is clearly more than enough demand to take a good look at the Fusion Guitar. It is available now directly from the Fusion website for $1,399 in Rosewood and Maple variants with a custom-designed padded gig bag.